The Axe Yacht Club sits on a shingle bank at the mouth of the river Axe. In earlier times, the river was navigable by boat and ship as far as the village of Axmouth. Over time, through the work of the tides and man-made land reclamation, the river began to silt up. The shingle bank at the river mouth began to extend from the west, resulting in the river taking a sharp swing eastwards before exiting through a much reduced mouth as seen today. In the early 1930s a group of friends started using their boats on the estuary, although there was little in the way of facilities. By 1936, there was sufficient interest from the owners of both sailing and motor craft to form the Seaton Sailing and Motor Boat Club. After the intervention of the 1939-1945 war, a new group of enthusiasts took an interest in the harbour and in 1948 the Axe Yacht Club (AYC) was formed. 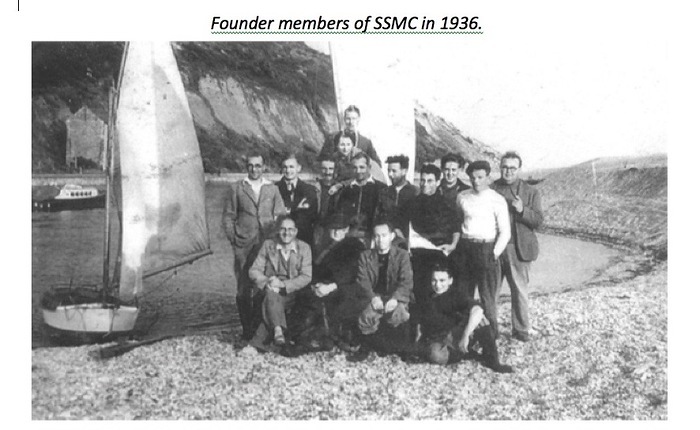 The founder members of the Seaton Sailing and Motor Boat Club joined the new organisation, thus maintaining the thread of continuity back to 1936. The AYC burgee, in blue with a bold black battleaxe, is a reminder of the long history of Axmouth and alludes to the ancient weapons found in the riverbed. In the post war years, dinghy sailing was the predominant Club activity, with the development of a seriously competitive dinghy fleet, comprising Burnhams, Wildcats and other lugged dinghies. In 1949 the then Commodore, Robert Redvers Lewis, proposed that the Club adopt an appropriate two man sailing dinghy for class racing. Discussions established that a dinghy of twelve feet overall length, clinker construction and Bermudan rig, capable of both beach launching and sailing on the tidal Axe estuary, would be most suitable. Initially the Burnham 12 impressed members. However, the high cost (£125) meant that the class was short lived. In 1951 Vice Commodore Jack Drew took the initiative, using his 12ft 06ins clinker built dinghy named'Curlew',he proposed using her as basis – it was from her that the Axe One Design was developed. 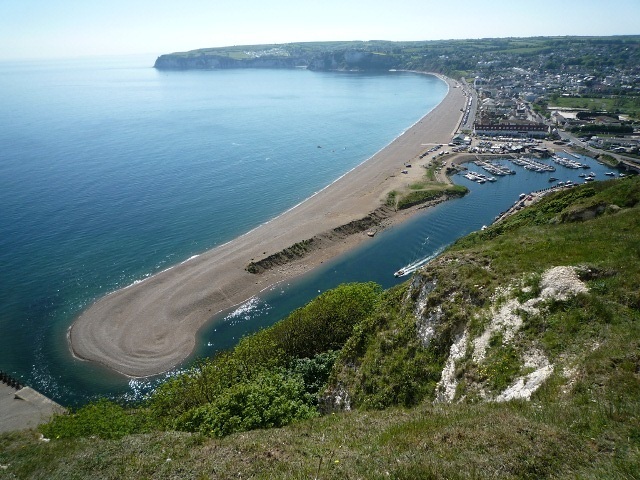 During this period the first clubhouse was constructed on the beach overlooking Lyme Bay; a pre-fabricated building erected by the members themselves, a self-help tradition that continues to this day. However, not all members were content and in 1952 a serious disagreement over the direction of the Club led to a split, with the majority of dinghy sailors leaving to form the Seaton Sailing Club. Dinghy sailing at AYC took 10 years to recover, initially with the development of the Axe One Design fleet and then in the 1960s the arrival of lighter planing dinghies – Enterprises, Mayflies, Graduates, Fireballs, Mirrors, and National Twelves. By 1968 the Scorpion dinghy began to dominate and in the early 1970s the Club fleet numbered approximately 30 Scorpions, with the leading boats also appearing at the top of the fleet in national and area championships. The Scorpion, being a two-man boat encouraged greater numbers to sail and brought in new cadets as crew. Meanwhile the Club infrastructure was developing under the leadership of a series of enthusiastic and farsighted Commodores. A proper lease was established with the landowners, systematic dredging and expansion of the basin was begun and the facilities generally improved. A new clubhouse was built in the early 1970s that included showers, committee rooms and a race control tower. This was destroyed by a dramatic storm surge in 1979 but was rebuilt in record time by the undeterred members at a cost of £2,500. This building remained until the most recent clubhouseopened in 2007. This was designed by John Ward (Commodore 1997-99) who was Beachmaster at the time and, in keeping with the self-help ethos of AYC, the majority of the construction work was completed by Club members – the cost this time being £188,000. In the late 1970's, with the rise in popularity of the single-handed Laser, the opportunity for cadets to develop as crew diminished and the number of dinghy sailors at AYC dwindled. Now cruiser sailing and motor boating came to the fore, spurred on by the availability of the new generation of relatively inexpensive fibreglass vessels on the second hand market. Over the years the Club's finances have been well managed by a series of savvy Treasurers and this has enabled engineering works on an epic scale. Around 10,000 tons of shingle was excavated to form the enlarged basin and 300 tons of rock was used to create the retaining walls. The volunteer Harbour Services team under the leadership of Pete Poulson undertook this activity. Dredging and expansion of the harbour has doubled the space available for moorings and more recently pontoons have been put down secured against the force of the river by piles driven as far into the bed as they can be seen above it. We now have capacity for around 100 moored craft and unsurprisingly there is a substantial waiting list. From a low of less than 20 dinghy sailors in the mid 1990s/early 2000's, the last few years have seen a welcome resurgence. With the establishment of the Cadet & Family Sailing section there has been renewed enthusiasm for getting the younger members of the Club out on the water. The Executive Committee invested some of the legacy left by John Templeton-Knight in 2011 in three RS Fevas for use by cadets. This, together with the introduction of a 5-year strategy for developing family sailing following the 2012 London Olympics, has led to a welcome growth in membership numbers. Current AYC membership is over 860 with 12% under 18 years. 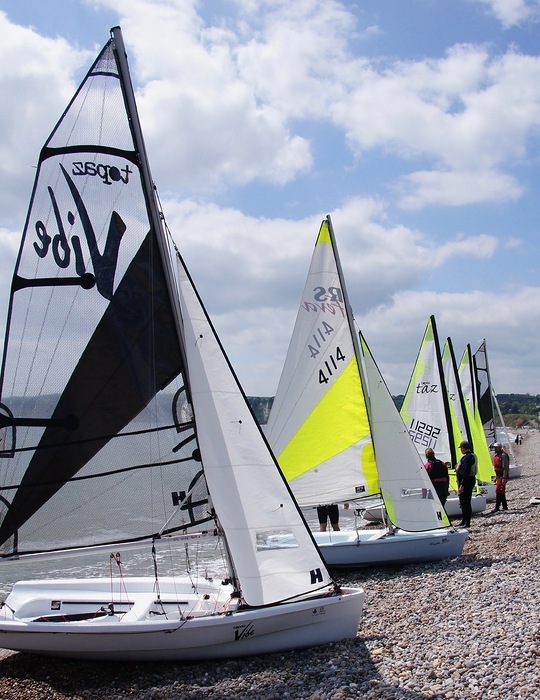 Thanks in part to a Sport England grant, the Club now has a fleet of modern dinghies for use during organised sailing sessions, which allow members of all ages to gain some basic skills, before considering buying their own boats. A thriving social side supports the Club's activities afloat, with regular events in the clubhouse. The Club is affiliated to the RYA and is also an RYA recognised training centre offering shorebased and on the water training courses. 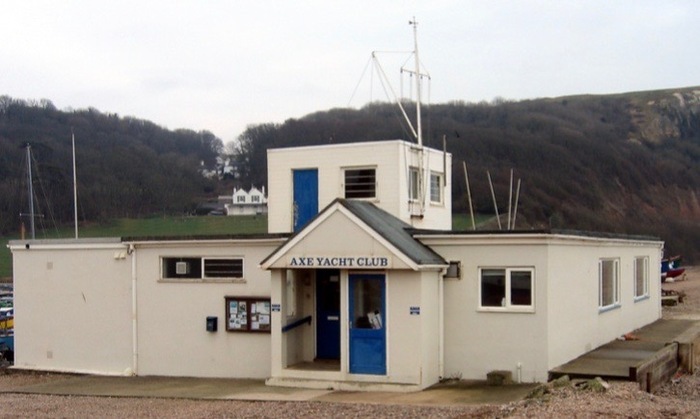 The great strength of the Club is that it enables its members to enjoy their own taste in activity afloat, be it dinghy sailing, cruising, motor-boating or fishing and yet still be proud to call themselves members of the Axe Yacht Club. Further details about the History of AYC are available in the 75th Anniversary Booklet that was produced in 2011. Download this from the link below.